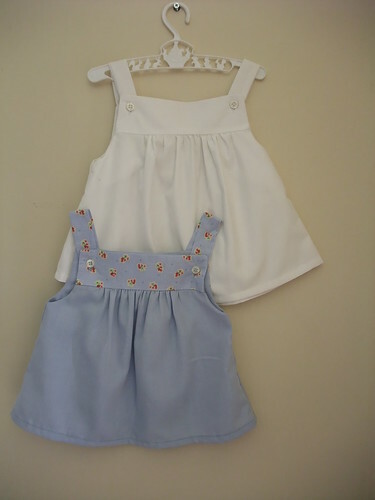 I had some leftover fabric from the blue shirt I used making the blue baby top I posted a week or so ago, and used it to make some bloomers for Sophie. I'm getting good mileage out of my husband's shirts, I must say. This is a paper doll I made using the skeleton invitation on the Martha Stewart website, and a picture of my son's head. It has magnets on the back, and is thus stuck to the fridge, and seeming to be striking a new pose whenever I go into my kitchen (I thought my son would hate it, but its kept him in stitches most of the evening ) Its actually given me a great idea for a school holiday project - watch this space! This bear is adapted from a pattern in the book, softies. I've just lengthened the arms and legs, and changed the face a bit. I love this pattern, its so easy! If you came to my house you could tell I love it, I have about fifteen versions of this character around the place. I made this for my two month old daughter, just to counteract the mountain of PINK dollies she received when she was born. I'm not sure even what sort of creature it is, but it is wearing a dress that I wouldn't mind having in my wardrobe and a be-ribboned beret. I love having a new baby, I've been able to make heaps of things from all the little bits and pieces I've had lying around for ages. Although these little tops were made from some business shirts my husband put in the charity shop bag, I've put them in this general clothing section, rather than the reconstructed clothing section, because the integrity of the original shirts is gone, I basically just farmed them for fabric. I can see myself making heaps of these, they only take about forty five minutes to make from cutting the pieces to completion - love quick stuff!